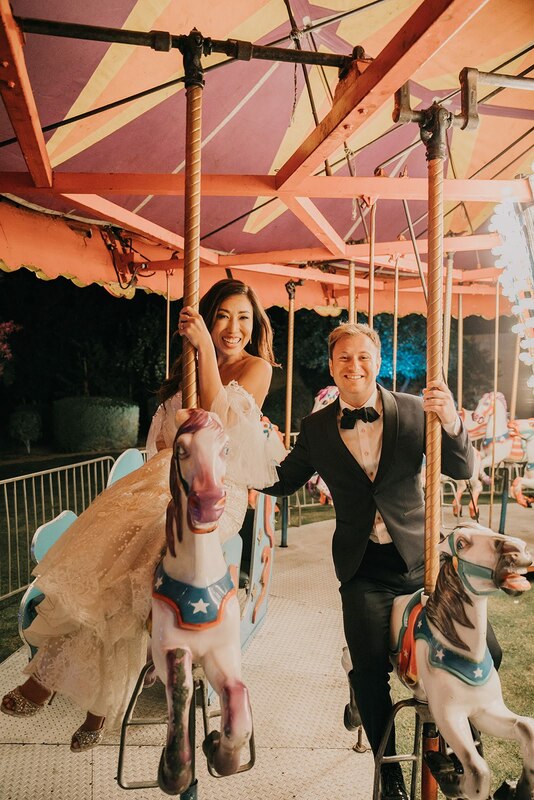 There was very little about Blogilates founder Cassey Ho‘s wedding to Sam Livits that wasn’t, well, magical. 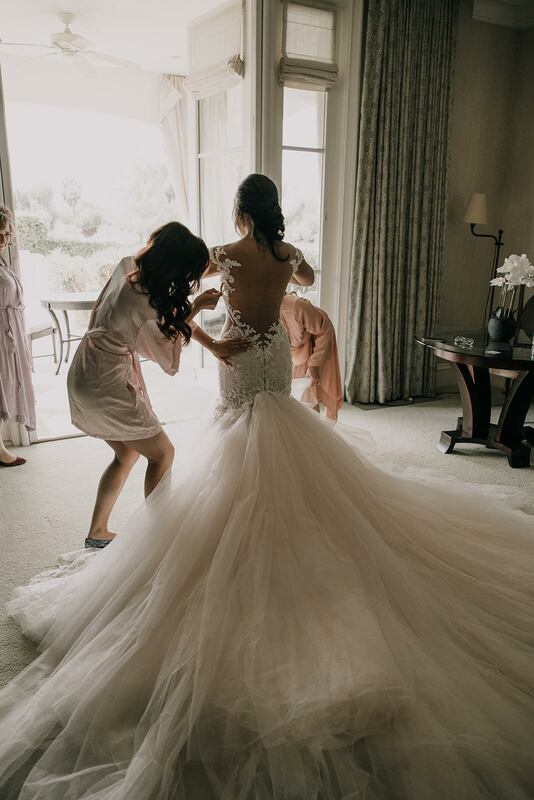 The couple and business partners met 10 years ago when Livits, now 32, was a finance tutor at Whittier College’s Center for Academic Success, and Ho, 31, needed tutoring to redeem herself after a recent finance test. 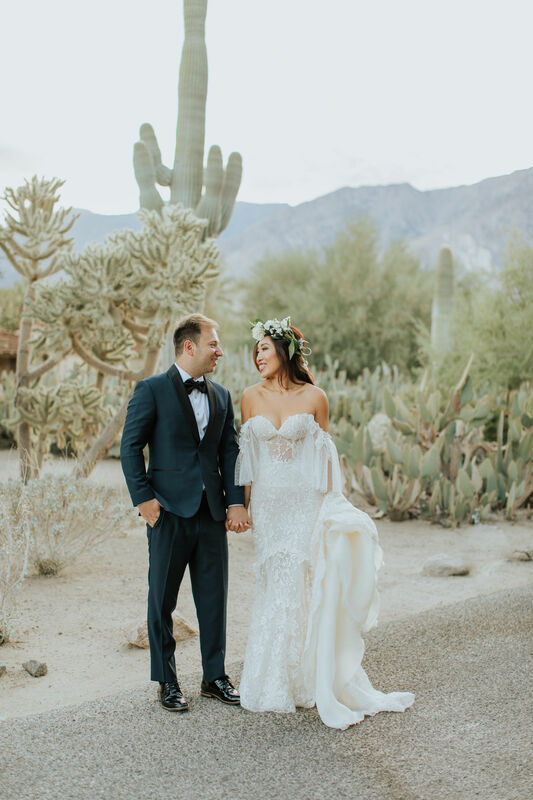 The theme of their October 6 nuptials at The Solomon Estate in Rancho Mirage, California, was “enchanted oasis,” and everything else followed. 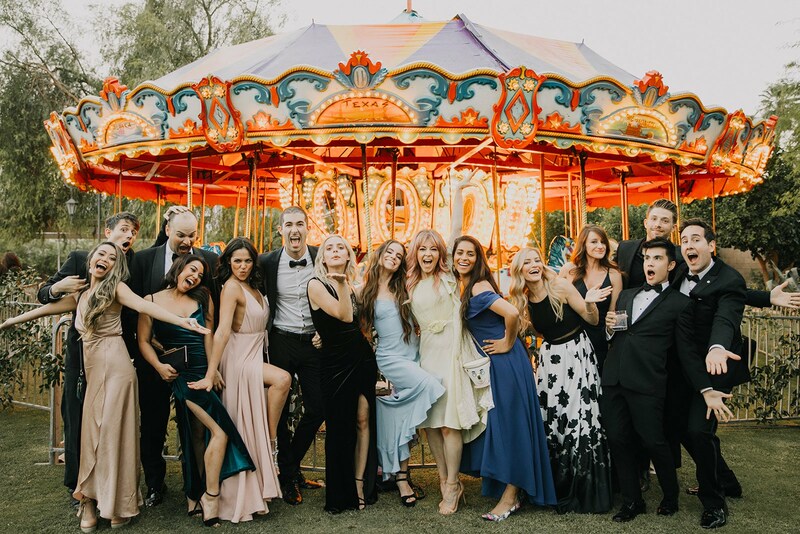 Ho and Livits sought to create a fantasy world for their 140 guests, one that reflected their own zest and enthusiasm for life, both individually and together. 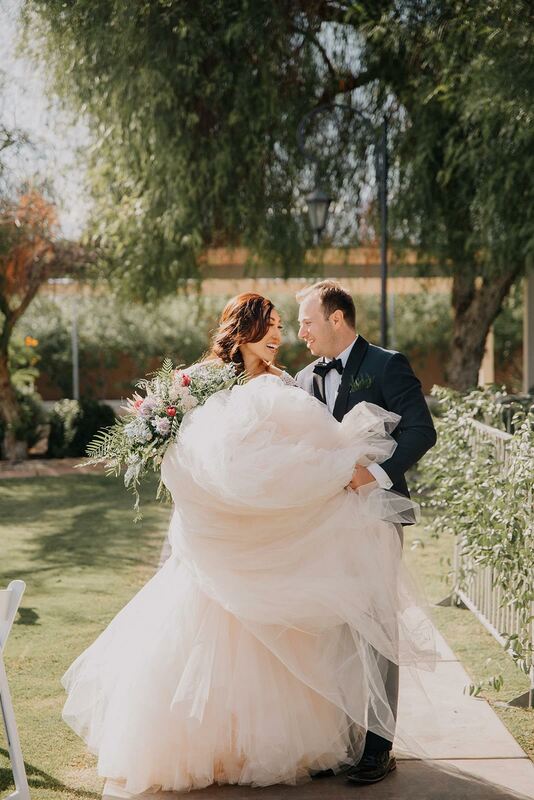 Here, The Knot has all the inside scoop on the pair’s magic-filled day, from start to happily-ever-after finish. 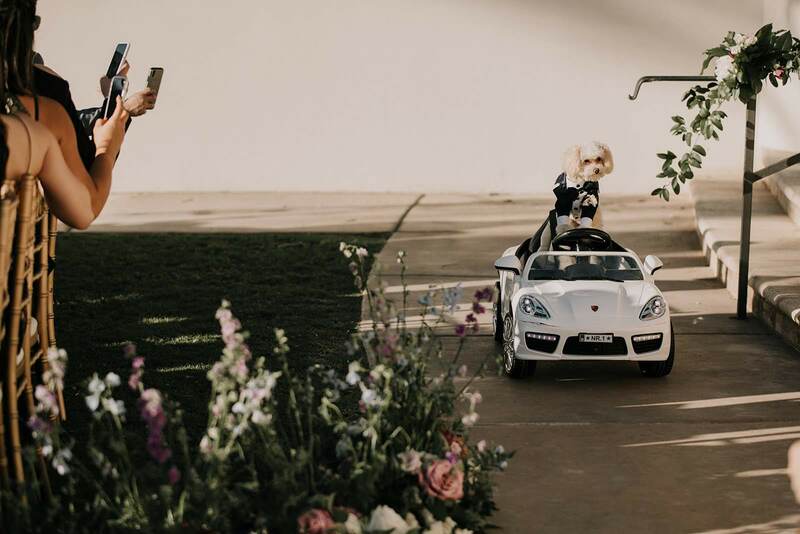 The Solomon Estate turned out to be it. 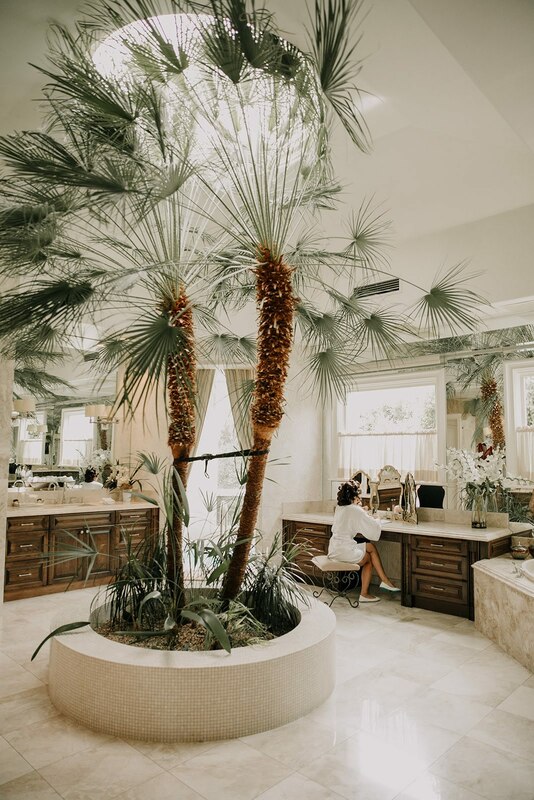 Set in the heart of Palm Springs, the estate offers up gorgeous desert views (and nice, warm weather!) 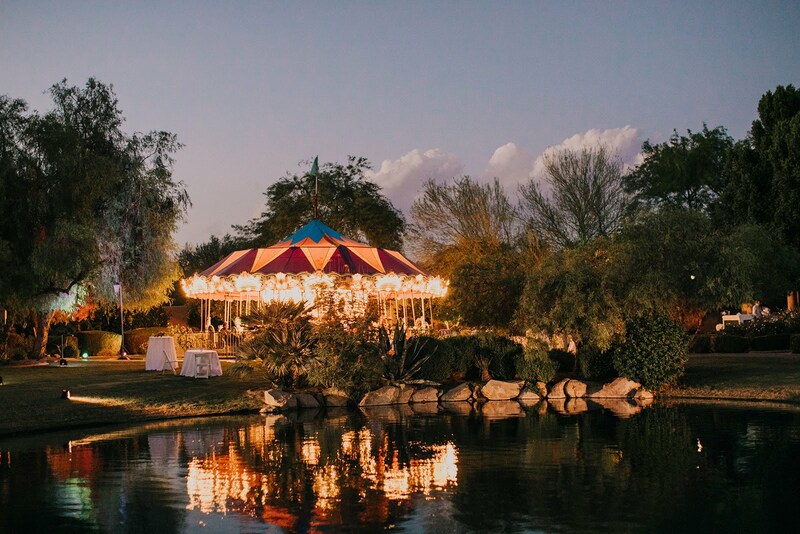 along with luxurious amenities, ideal for the couple’s vision of an oasis of fantasy. 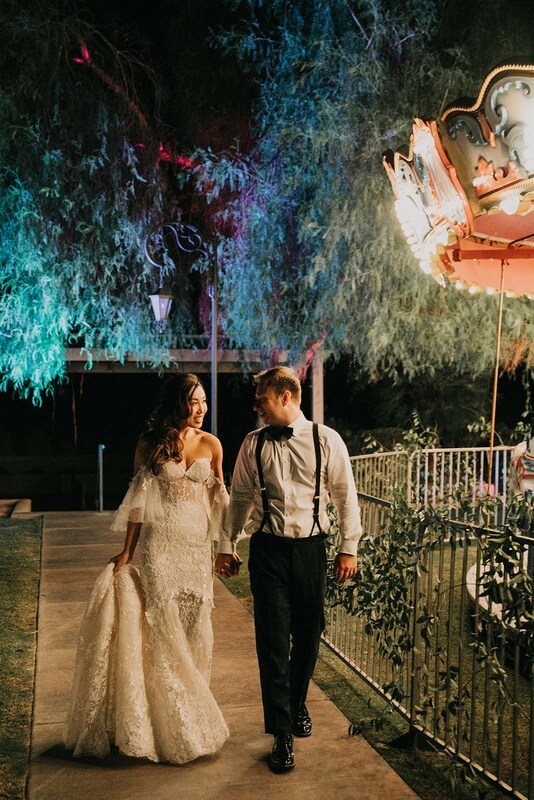 “We wanted our guests to step into a new world for the evening,” Ho says. 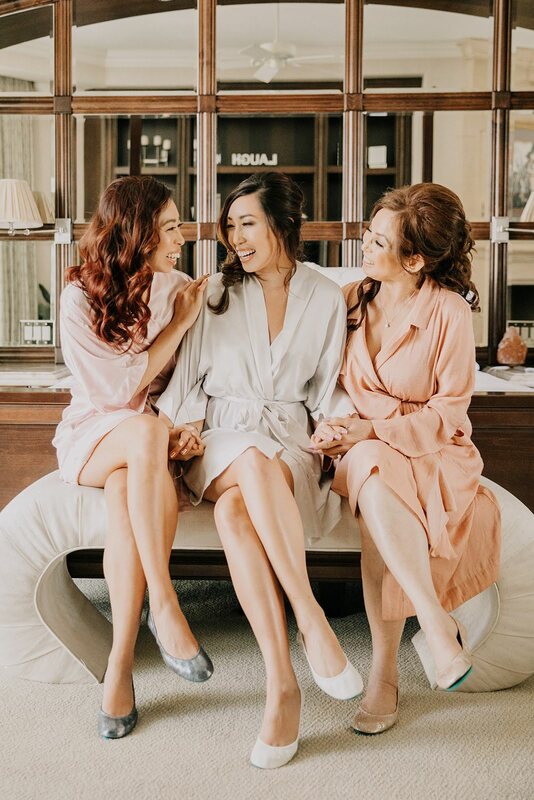 Ho and Livits kept it simple with their bridal party—just Ho’s sister Jackleyn as her maid of honor and the groom’s best friend as his best man. 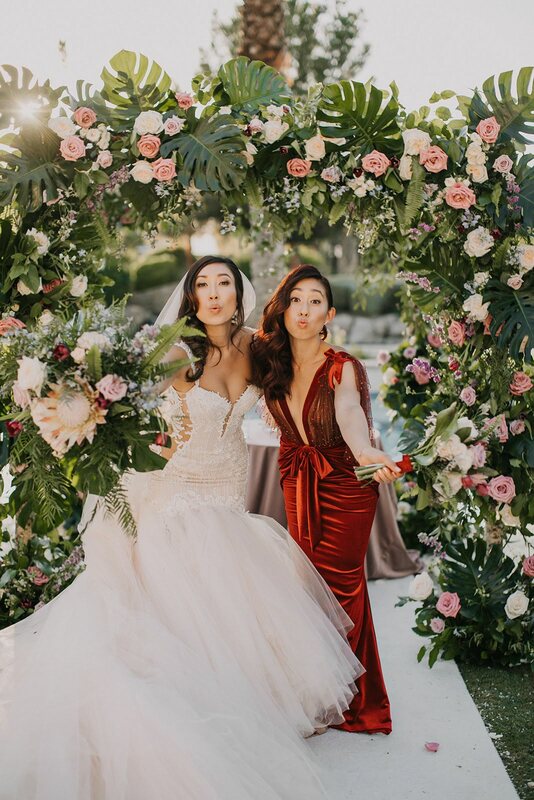 “Jackleyn fell in love with this burgundy velvet Old Hollywood dress that we saw Julianne Hough wear to a taping of Dancing With the Stars when we were there to support one of the contestants, Lindsey Stirling,” Ho says. 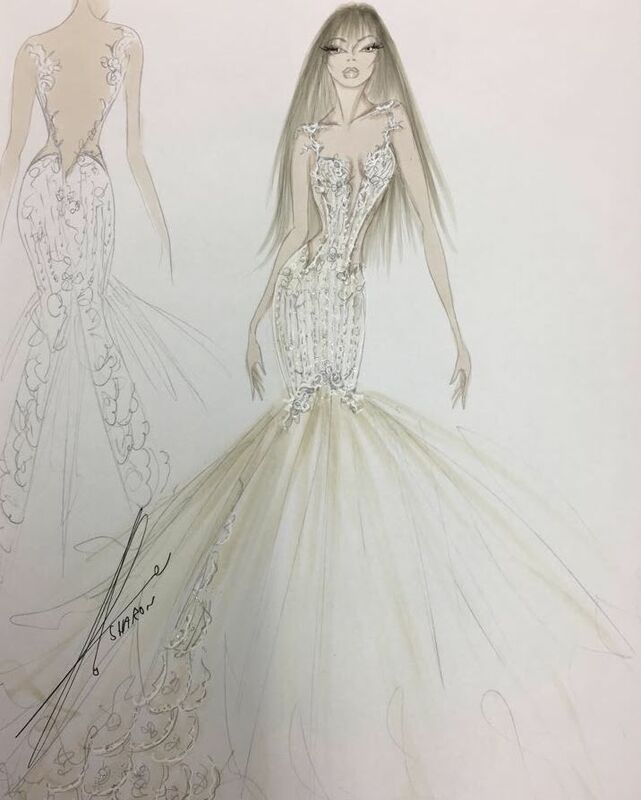 “Then, I saw that the Galia Lahav posted a photo Julianne that very night. 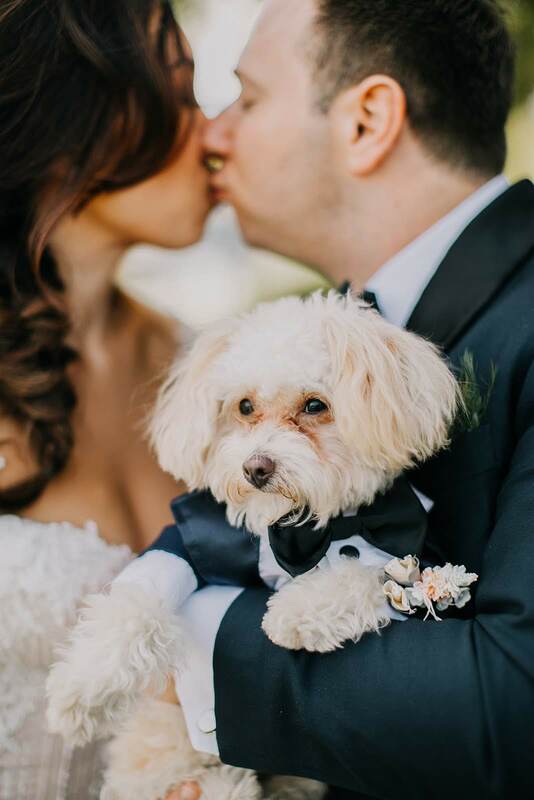 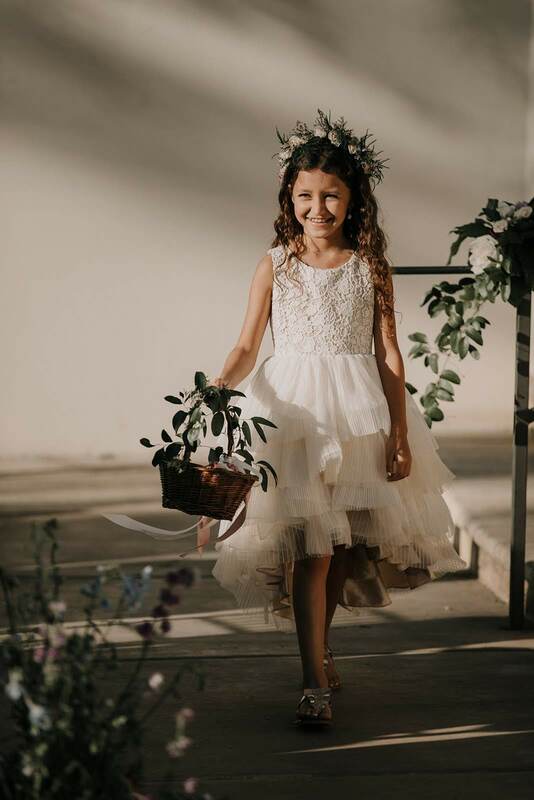 That’s when I knew we had to have Jackelyn wear that dress to the wedding.” The couple had one flower girl, Nola, who wore a custom-made dress from RenzRags in blush and ivory, and one ring bearer: Sir George the Magnificent, their puppy, who wore a custom-made midnight blue tuxedo to match the groom. 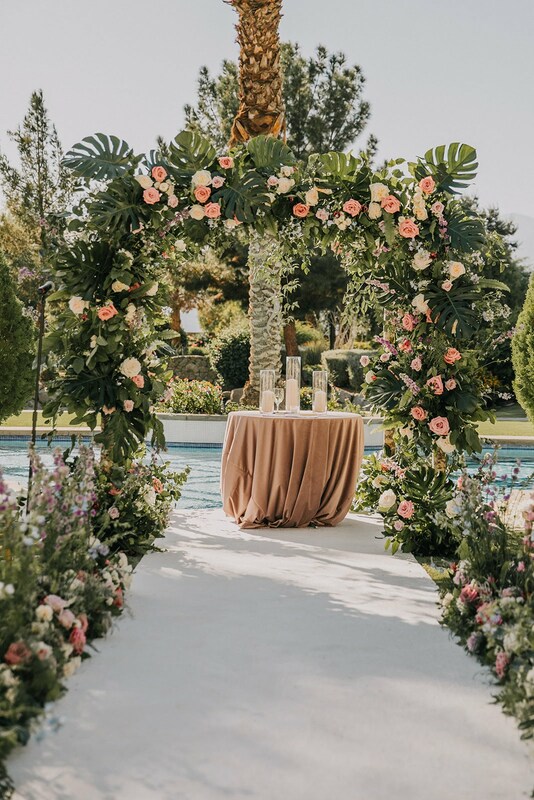 To give their ceremony and reception a true oasis touch, they worked with Lovesome Blossoms in L.A. to incorporate both romantic, soft flowers and lush, strong tropical greenery. 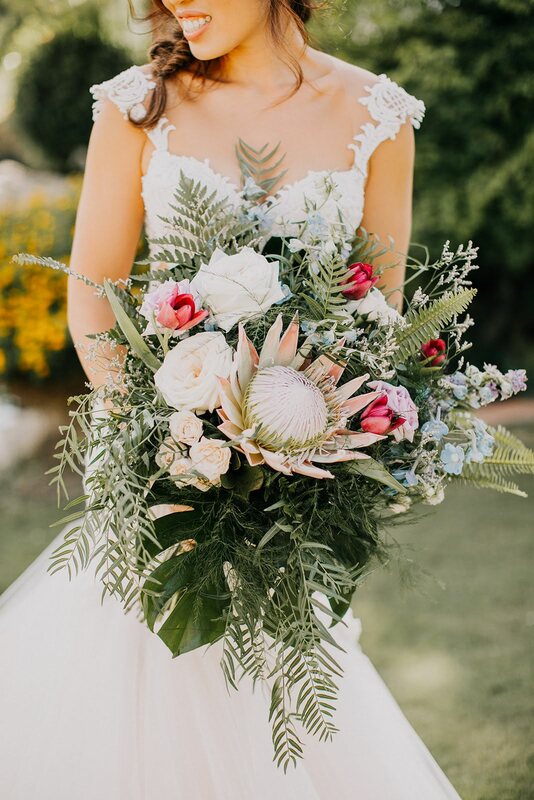 For bouquets, Ho and her sister had large proteas, which Ho called “strong and intense,” and the men wore a modern spin on a classic boutonniere: a “pocket square” made of greens and accentuated with a gold asymmetrical design. 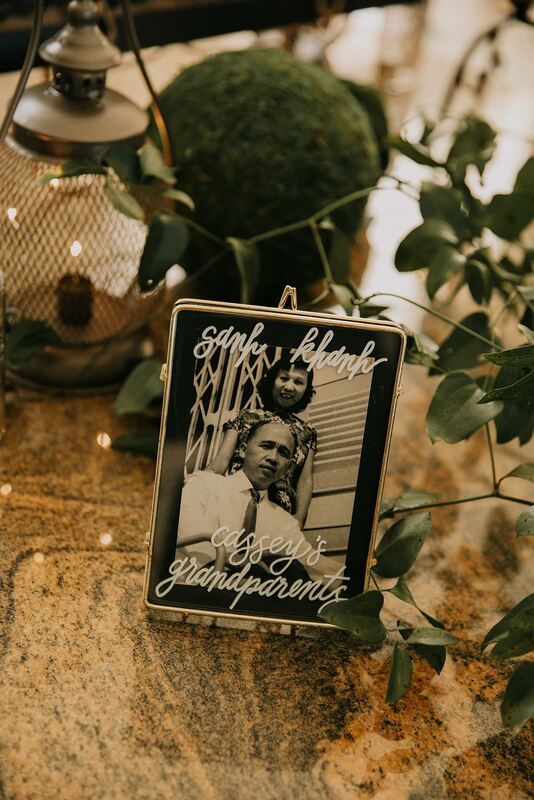 Ho personalized much of the wedding stationery, though her hand in the process was unintentional. 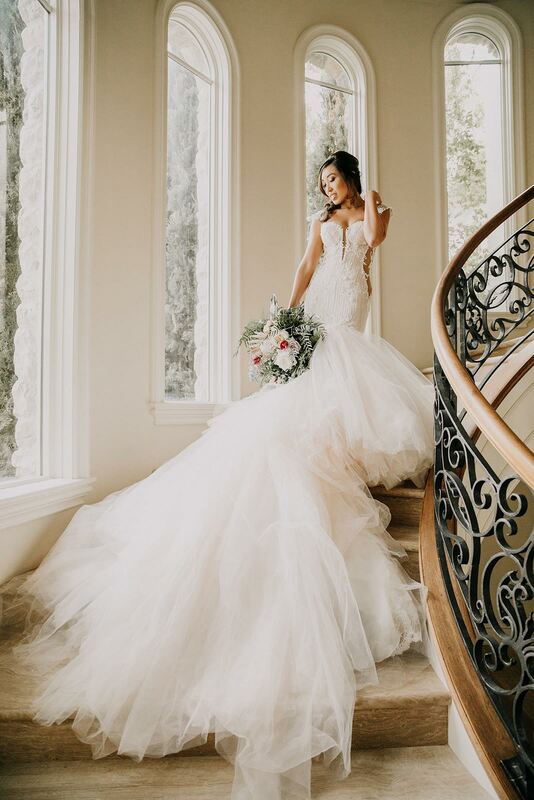 According to Ho, the couple’s calligraphy person bailed at the last minute, leaving her to have to figure out a solution. 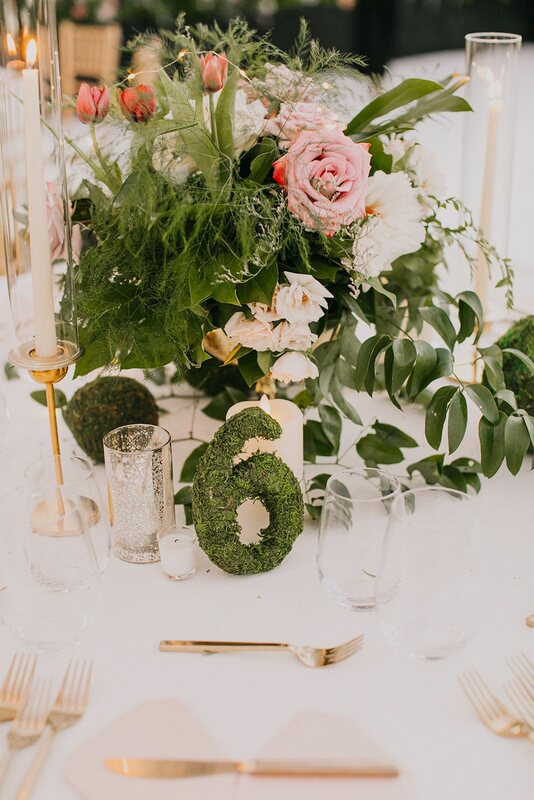 “Calligraphy was a personal goal of mine for 2018, but I never anticipated doing it for our own wedding!” she says. 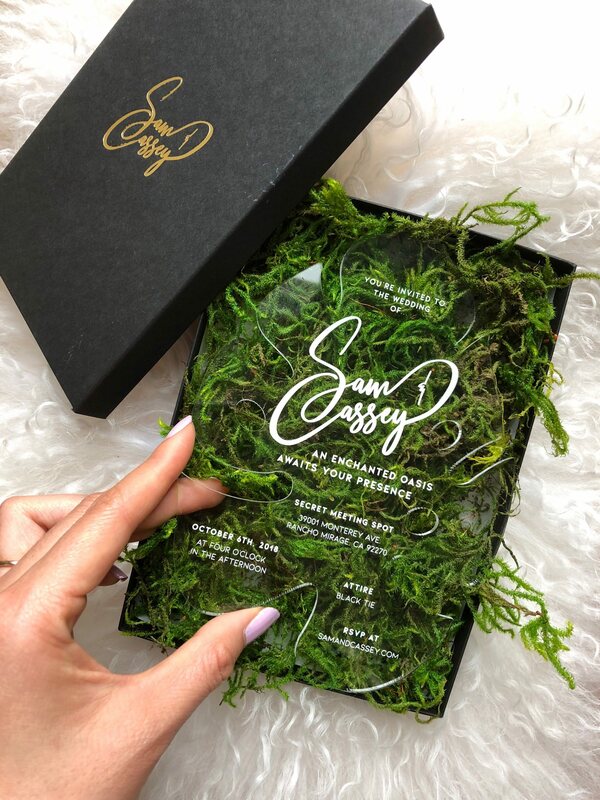 “I watched a bunch of YouTube videos and eventually taught myself how to do calligraphy.” In addition to designing their logo, Ho also designed an acrylic monstera leaf that they later placed into custom black boxes filled with live moss for each guest. 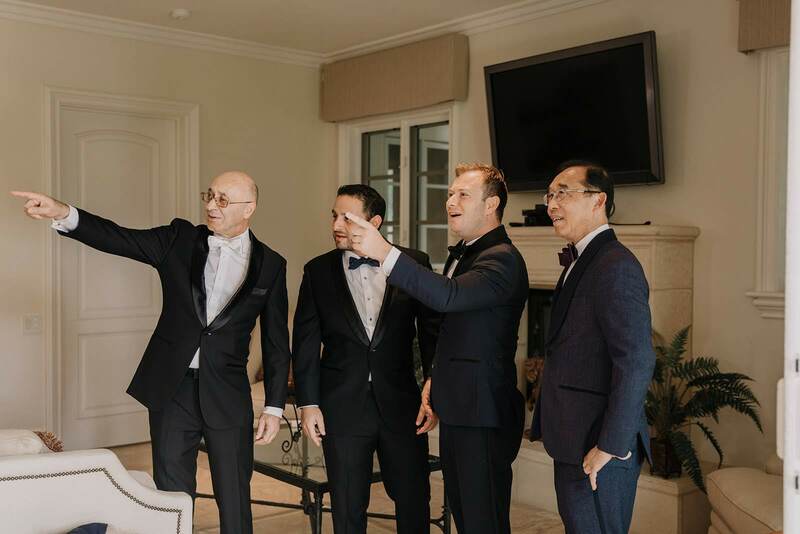 “Because Sam and I are of two very different cultures—Chinese/Vietnamese for my side and Jewish for his side—we wanted to find a creative way to have our ceremony reflect both of our backgrounds,” Ho says. 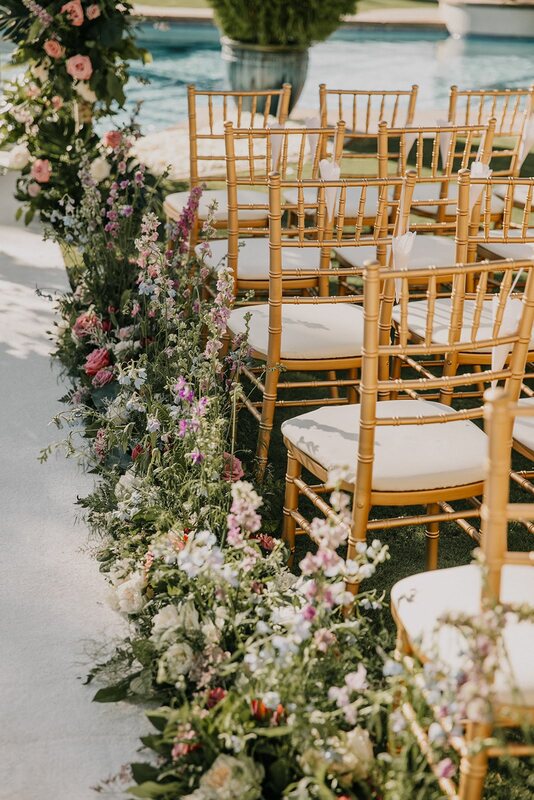 They honored the Jewish side by having a Chuppah, drinking wine out of a glass, and having Livits smash the glass with his shoe. 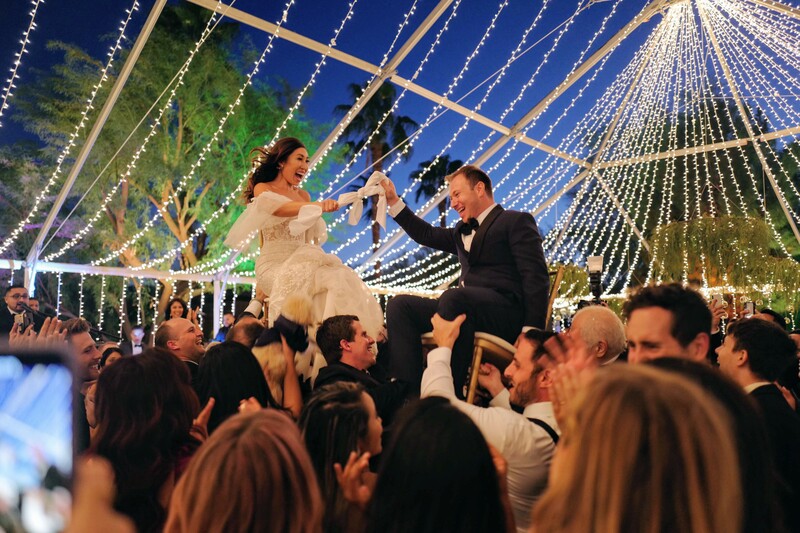 They also did the Hora at the reception, and the newlyweds were lifted into chairs. 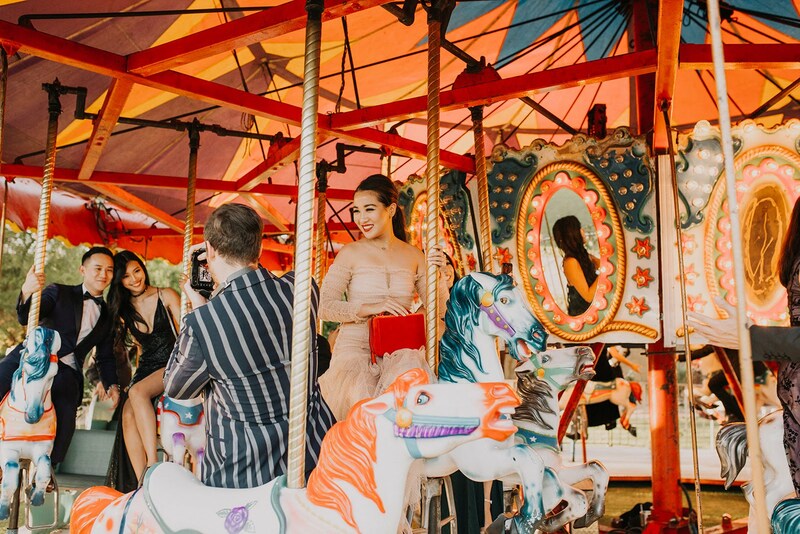 They honored the Asian side by having their officiant recite a Chinese proverb about the ring and inviting their ancestors to join the ceremony through a candle-lighting ceremony. 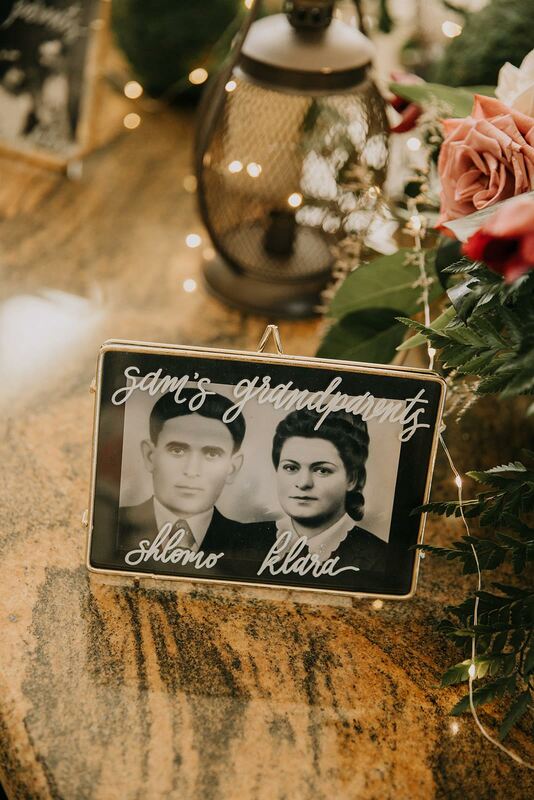 The couple showcased both of their cultures via their reception menu, which included “cultural tapas” like dim sum (har gow/crystal shrimp dumplings and shumai/chicken dumplings). 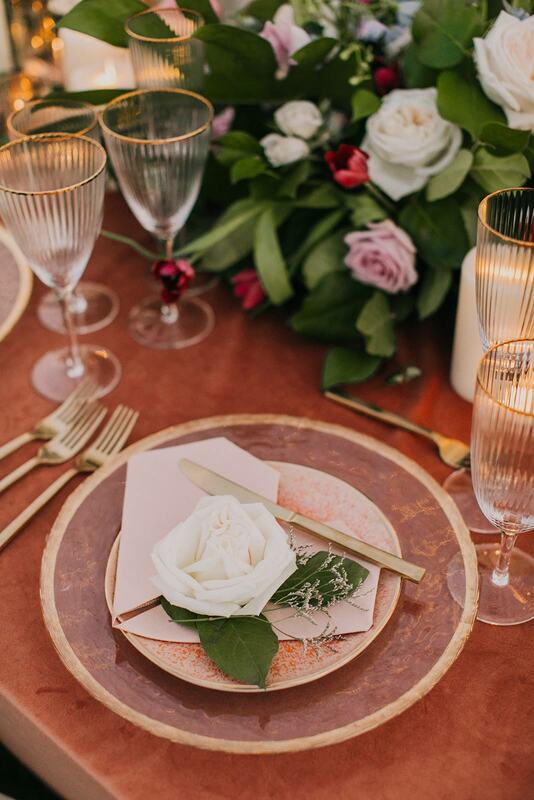 They also served summer rolls, fried rice, tofu skin rolls and honey walnut shrimp coupled with falafel, pita, hummus and shwarma. 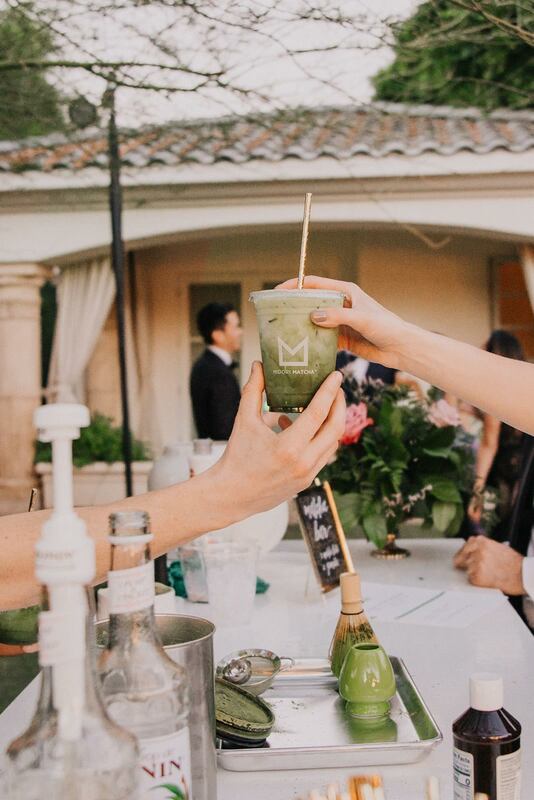 It was important to Ho that there were alternatives to alcoholic beverages during the cocktail hour (she is a non-drinker), so the couple opted for a matcha bar where a barista custom-made tea drinks and mouthwatering matcha milkshakes for their guests. 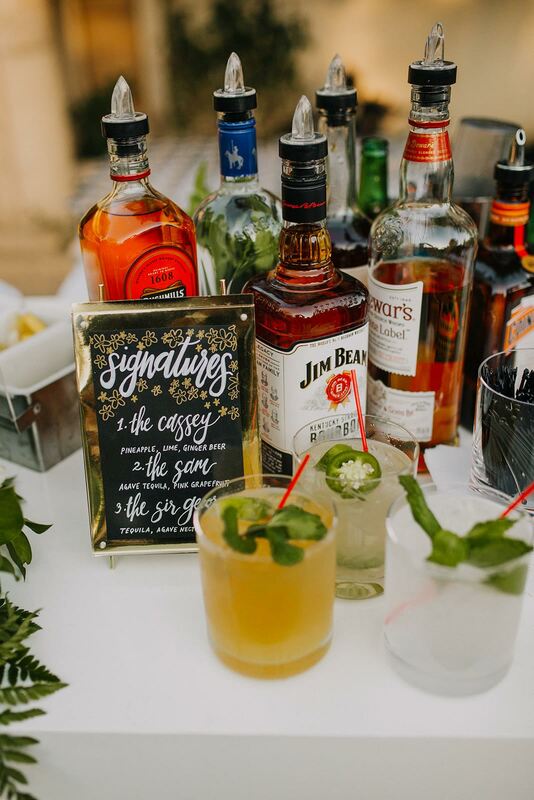 Signature bar drinks included The Cassey (a spritzy, non-alcoholic pineapple-y drink), The Sam (a Paloma) and The Sir George (a spicy margarita). 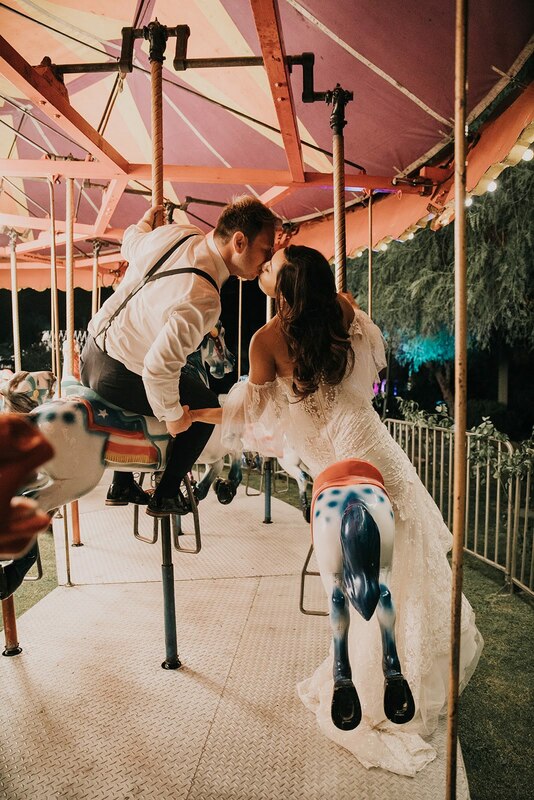 Perhaps just as exciting during cocktail hour was the entertainment, which included a carousel. 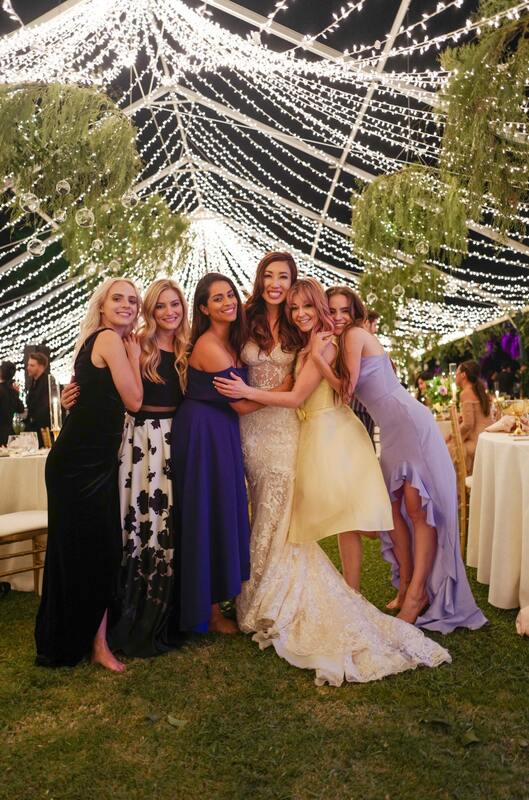 “The thought of my friends riding horses in long evening gowns with their legs swept over to one side is what sold me on this idea,” she says. 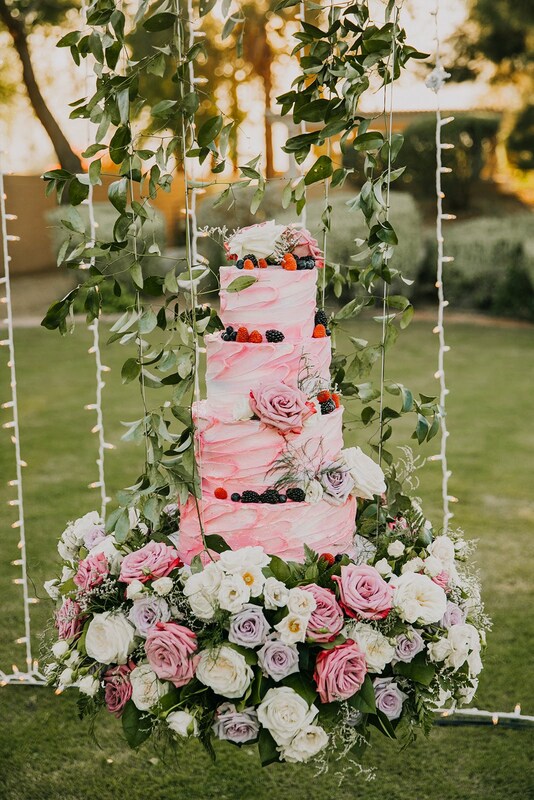 “Our cake was very special to us,” Ho says. 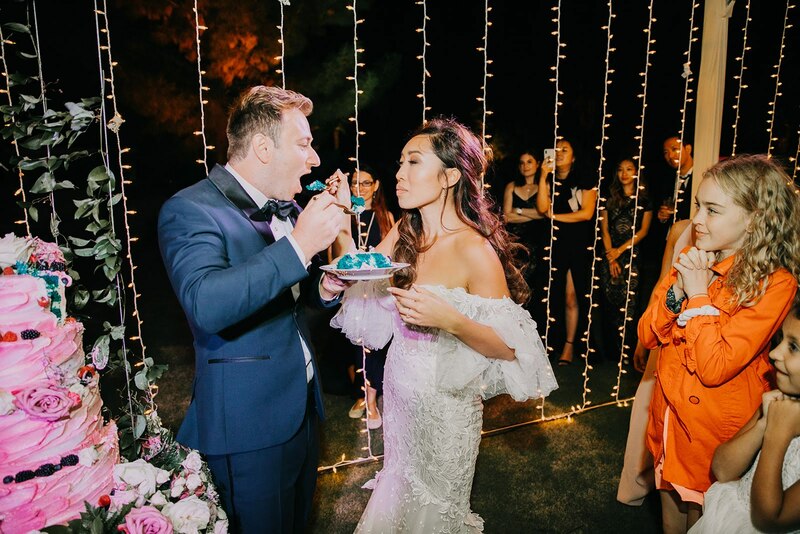 “It was a blue velvet cake with cream cheese filling and a buttercream frosting.” She says the couple discovered blue velvet cake five years ago at L.A. dessert hotspot MILK and knew that it was going to be their cake of choice. 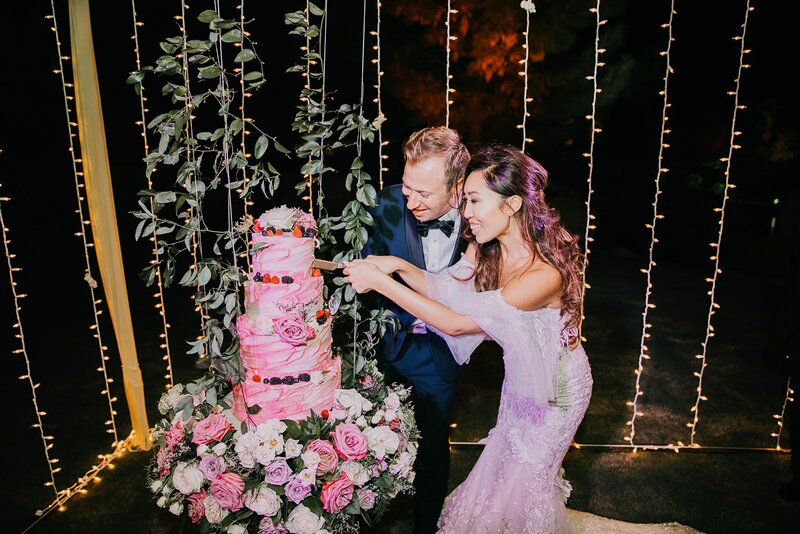 Even their wedding cake got the magical treatment: “We had a floating cake that hung from the ceiling on a display of florals,” Ho says. 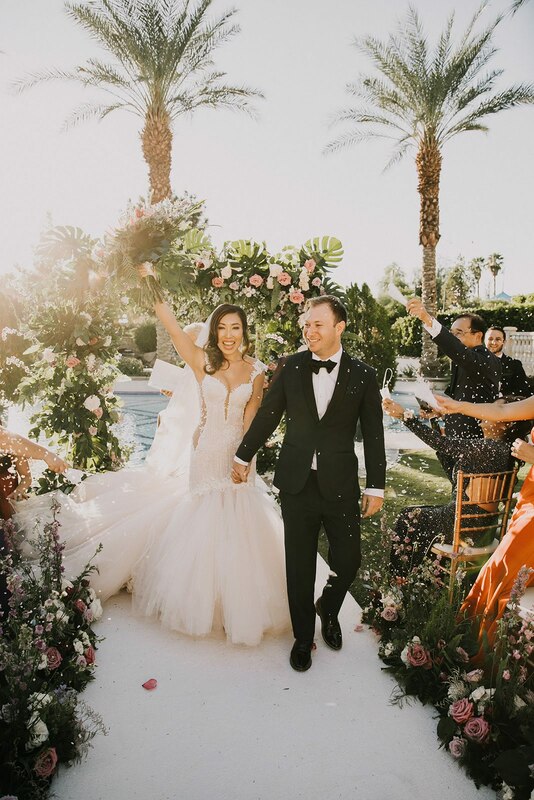 Be the first to comment on "Exclusive: ‘Blogilates’ Personality Cassey Ho Shares Her “Enchanted Oasis” Palm Springs Wedding Album"